ConceptDraw DIAGRAM is a Wireless Network Drawing software. The Wireless Networks solution from ConceptDraw Solution Park helps network engineers and designers efficiently design, create and illustrate wireless network diagrams. There is a bundle of the vector stencils, examples, and templates for drawing different types of network diagrams one can obtain with ConceptDraw DIAGRAM. Sample 1. Ultra high performance WLAN. When planning a WLAN for a complex office environment, it is important to be able to clearly display the interactions between all devices. This template shows the relationships between devices and their technical capabilities. Creating a detailed network plan can cause a lot of headache to an unexperienced user. And it is worth mentioning that ConceptDraw DIAGRAM v12 is a decent tool for creating a network diagram, a tool that is easy-to-use. To get an accurate diagram use the vector shapes from the special libraries that represent workstations, network appliances, wiring systems and connect them with smart-connectors, just as simple as that. This communication network diagram displays the way different components of a computer network communicate with each other. When representing network information, such as depicting all the equipment in a large network, it is helpful to make visual representation. Network diagram provides an easy way to show the way the connections between an equipment in a large network. This diagram of a communication network depicts a network composed of three sub-networks. It uses a network equipment symbols to represent the different devices that make up a network communication including routers, Ethernet devices and end-point equipment. ConceptDraw Wireless Network solution includes several wireless network diagram examples that users can modify and make your own diagram. 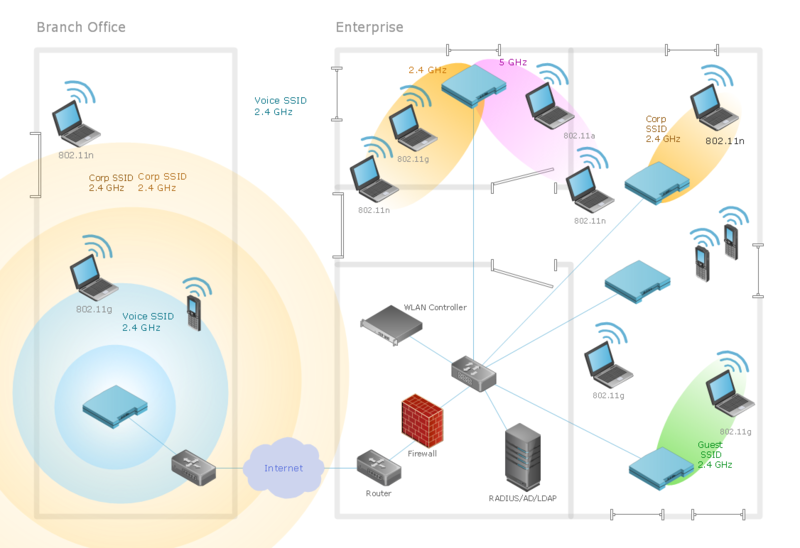 Wireless computer network diagrams help system administrators and network engineers to find out amount and type of equipment needed for each office WLAN. Computer and Networks solution extends ConceptDraw DIAGRAM v12 diagramming and vector drawing software with the ability to create professional-looking Cisco network diagrams quickly and easily, allowing you to clearly represent and communicate network architecture, topology, and design to engineers, stakeholders and end-users. ConceptDraw Wireless network diagram helps network engineer to design, mount and support WLAN or WWAN. Wireless networking is useful visual tool for identification of all required equipment, and calculation the cost of creating or updating wireless computer networks. ConceptDraw DIAGRAM v12 extended with Wireless Networks Solution from the Computer and Networks Area is the best wireless network diagramming software.